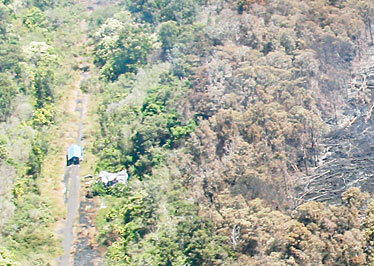 This aerial photo of an eruption site at Kilauea Volcano showed a lava fountain spewing 39 to 42 feet high yesterday. 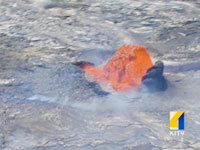 Kilauea Volcano has undergone yet another personality change. 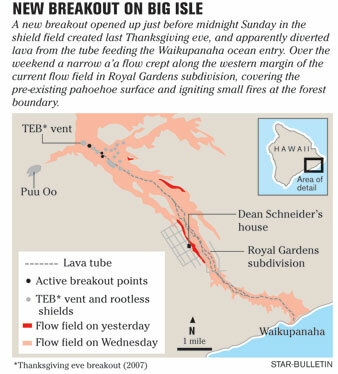 Scientists said yesterday that Sunday's new lava breakout has apparently diverted lava from the tube feeding the Waikupanaha ocean entry point. Meanwhile, a narrow aa flow crept through Royal Gardens subdivision over the weekend, covering the pre-existing pahoehoe surface and igniting small fires at the forest boundary. The burning brush also threatened the makeshift house of Royal Gardens' self-described hermit, Dean Schneider, who was not home at the time. The 'a'a flow active over the weekend in Royal Gardens came within 50 to 75 yards of the structure in the photo. Fires sparked by the lava came even closer. HILO » Lava fountains up to 40 feet high burst out about four miles above a self-described hermit's homestead in Royal Gardens on Sunday night and continued through yesterday. A wave of lava about 40 feet high produces spectacular fountain. A brush fire started by a long, thin finger of lava set the wet, rotting wood of Dean Schneider's house smoldering. Jack Thompson, Schneider's only neighbor in the otherwise deserted 3-square-mile subdivision, put out the fire. Schneider, 57, knows his homestead is at risk, separated from lava flows by a rise of land just 10 feet high. For now he is taking the new developments in stride, hoping for a helicopter ride home with his dog, Alias, part Doberman, part pit bull. Beyond that, he has a ticket next Tuesday to the mainland to visit his wife, Sandra May Stevens. What will greet him upon his return is anyone's guess. Thompson's house is downslope and west of Schneider's and not in immediate danger. 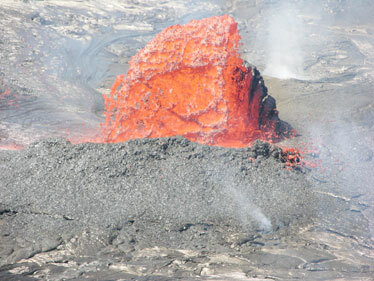 Since March, when Hawaii County opened a lava viewing site, lava has been flowing into the ocean below Royal Gardens. Last week, the 6-mile path from Kilauea's east rift vent, through the center of Royal Gardens in lava rock tubes and down the sea, began to change. New breakouts took place near the vent. Yesterday the flow into the sea slowed to a trickle and may have ended, said Jim Kauahikaua, head of the Hawaiian Volcano Observatory. 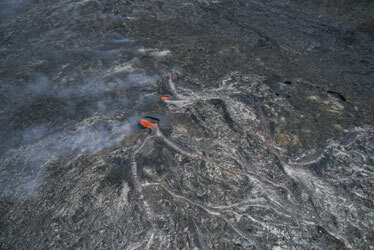 The lava breakout that started Sunday was actually composed of three separate points, as seen in this photo. The new attraction for the viewing site could be a hillside lava flow, said John Drummond at Hawaii County Civil Defense. Civil Defense officials have warned Schneider in the past that they cannot help him if he insists on residing in remote Royal Gardens, accessible only by hiking or helicopter. Living at the edge of creation, Schneider tries not to take anything for granted. The tour helicopters that buzz his home regularly see nothing but a "hermit moron who runs around naked," as he puts it. But his time at Royal Gardens is devoted to a higher purpose, "trying to find the even path" through life, he says. Kilauea drives home the lesson that all things are temporary. His makeshift house is just a pavilion, built with scraps from other houses abandoned long ago when the first lava entered the subdivision in 1983. The pavilion is not even on his own land, but was built mistakenly on acreage designated for a park, he said.